It is a requirement of your Agreement, that the goods are protected against Theft and Accidental Damage. We can arrange Theft & Accidental Damage Cover for £1.96 per week. It is a requirement that products purchased on a credit agreement are insured. We can offer Theft and Accidental Damage Cover for £1.96 per week. 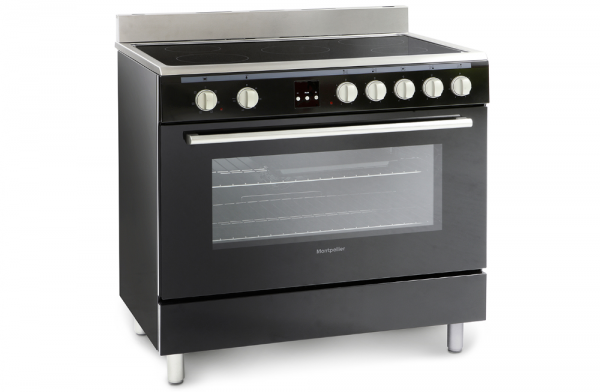 The Montpellier MR90CEMK Essential Collection Range Cooker in black, is a 90cm wide, all electric range-style cooker that features a ceramic hob and a high capacity single cavity oven and an LED Timer display.. The black ceramic hob contains 5 fully-variable heating elements and is set into a Stainless Steel surround, which features an integral stainless steel Splash-back. The Multi-function Electric Fan Oven has an easy clean enamel interior and has integral guide rails, the guide rails provide the choice of 6 shelf positions and the oven is supplied with 2 full-width Wire Shelves. The cooker is fitted with a double glazed, ventilated oven door, which spans the full width of the cooker and the door is hinged at the bottom corners to provide easy access to the oven interior. In addition, the cooker has a Storage Compartment, which is situated directly below the oven door.